November 2017 file photo taken following a fire that destroyed a warehouse at the former Lincoln paper mill. Lincoln and Howland were among the towns responding to a fire at the former Lincoln Paper and Tissue LLC mill site on Wednesday. The fire departments were there at about 4:30 p.m. It was unclear whether the fire was part of a permitted burn at the Katahdin Avenue site as part of the demolition process or an accident arising from the demolition, a Lincoln fire official said. Wednesday’s blaze was the latest in a series of fires and calamities at the site. Lincoln Paper and Tissue LLC filed for Chapter 11 bankruptcy protection in September 2015, eventually laying off 128 workers. 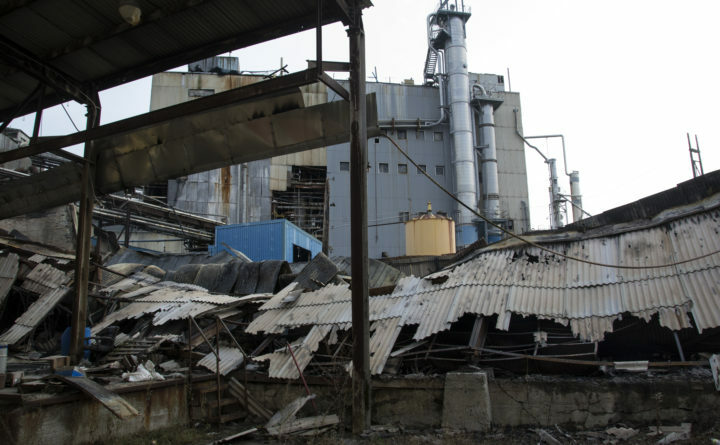 A boiler explosion in November 2013 left the mill leaking cash. Lincoln officials voted in March, 2017 to seek a Superfund designation for the site for the estimated $20 million cleanup of its asbestos, dioxin/furan, metals and Polychlorinated Biphenyls, or PCBs. Smoke could be seen rising from one of the silos in the multi-building site, said Steve Clay, a Lincoln Town Council member who was driving by at the time. Two arsons were reported there in November. The fires, which destroyed a large warehouse and a shed on Wednesday, sparked fears of contamination, but no extensive environmental hazards resulted from the fires. David Parsons, 59, of Lincoln was charged with arson for allegedly causing the fires that burned a scale shed and a 300-foot-long warehouse, according to Department of Public Safety spokesperson Stephen McCausland. That blaze at the 387-acre Lincoln Paper and Tissue LLC site, near Mill Street, burned for more than three hours before it was extinguished with the help of nearly a dozen fire departments. Parsons is a former employee of the mill, McCausland has said. Parsons was indicted in January and his case is pending. As of Wednesday, he remained held at Penobscot County Jail, a jail official said.